ENTER HOUSE TO BOUNCING AREA. CLIMB UP STAIRS TO SLIDE. CAN BE USED DRY OR OPTIONAL POOL TO FILL. MAX WEIGHT IS 570 LBS. MAX WEIGHT OF INDIVIDUAL IS 170 LBS. MINIMUM HEIGHT IS 42 INCHES MAX HEIGHT IS 72 INCHES. TOTAL WEIGHT DEFLATED IS 360 LBS. 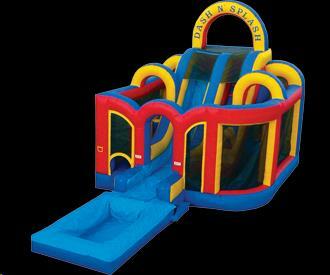 * Please call us for any questions on our inflatable dash and splash rentals in Kalamazoo MI, and Southwestern Michigan.